Rationalist Judaism: Mazeltov - The Wild Animals Are Finished! There were many difficult decisions that I had to make along the way. What is a yachmor and a zemer? Should the dog be in the volume on chayos, or behemos? Is the kelev hayam a seal or an otter? How should I handle statements about animals that are in conflict with modern zoology? Hopefully, I made the right judgement in these cases. There are a few tricky decisions that I still have to make, and which may affect my choice of publisher/ distributor. Unlike my books on Torah and science, this is a work that is suitable for, and will be of interest and benefit to, a very broad audience, from entirely secular to charedi. But, depending on how it is packaged, it may lose readership from some circles. Let me give a primary example, which might seem silly, but is in fact of great significance. Which system of transliteration should be employed? "Shabbos" or "Shabbat," "Avos d'Rabbi Nosson" or "Avot d'Rabbi Natan"? Decisions such as these affect which type of people will buy the book. - There are probably more potential readers on the "right." - People on the right are more likely to be put off by Sephardic transliteration than people on the left are by Ashkenazis transliteration (since they all use Artscroll anyway). But on the other hand, perhaps it's important for the centrist/ Zionist Orthodox community to be strengthened via increased use of non-Artscroll style transliteration. Then there's the similar, but not identical, question about referring to names of people and sources. Should it quote Jeremiah or Yirmiyah, Iyov or Job, Bamidbar or Numbers, Bereishis Rabbah or Genesis Rabbah? Here, too, there are factors both ways. People on the right probably all can adapt to the secularized transliteration, but secular Jews may not be able to adapt to the more literal Hebrew transliteration. But on the other hand, the secularized transliteration gives the book a certain feel that might dissuade more right-wing readers from reading it. Decisions, decisions! Meanwhile, you can download the table of contents, and two sample chapters, at this link. Dedication/ sponsorship opportunities are also available; please see this link. "Avos d'Rabbi Nosson" or "Avot d'Rabbi Natan"
Mazal tov on your accomplishment. I wish you much success in this and other undertakings. I wonder, however, if you are correct in assuming that this encyclopedia will find favor in the Hareidi world. I assume, to the contrary, that your chapter on hyraxes will be considered at least controversial in that world and may lead to another ban. In any case, I don't see that you will be able to get haskamot on the book from prominent Hareidim. If so, then you may not need to cater to perceived Hareidi world biases such as Ashkenazi pronounciations or a 'heimish' way of referencing Tanach and classical sources. Why not just use your own current predilections and not be so concerned with maximizing your readership base. As it stands now, I see your book finding a place in most MO homes, and those Hareidim who never subscribed to the bans. The sample chapters are well written and very interesting, and the pictures are great. Older children, in particular, will find the book facinating. I would say דעלך סני לחברך לא תעביד (שבת לא א) but since the Ashkenazic (e.g., Shabbos) and Sephardic (e.g., Shabbat) pronunciation are both wrong (it should be Shabbath as the Yemenite Jews say) I can see that it wouldn't be so clear cut. "As you can see from my other books, I prefer footnotes. But in a book like this, it just wouldn't work - both from a technical perspective of page design, and because most readers would not want it." Is it currently the case that footnotes aren't possible from a technical perspective? Regardless of your choice of presentation, I look forward to the content of your book, (Rabbi Natan) [Ribbi Nathan]! And other people on the right might specifically buy the book because of its author! Especially considering its content. What other Jewish book is there that discusses this subject matter? My advice is to stick with Sephardi pronunciation, especially since NO ONE in academic circles takes Ashkenazi transliteration (even remotely) seriously. Ashkenazi transliteration/pronunciation, I find, has more of a chance of throwing people off. As a Sephardi Jew (which makes me a bit biased), when I moved into an Ashkenazi neighborhood, no one had a problem understanding me, but I have to admit there was a serious learning curve for me. I basically had to re-learn Hebrew. Also, give all original sources in the original language! It's a major advantage for using any book in a scholarly capacity. I agree with the above post that you shouldn't worry about appeasing the "far right," as they probably won't buy it anyway. Dr Yehuda Levy had his first book banned in the 50s (Vistas From Mt Moriah), yet managed to get nice haskamos on his later books. A later book that he wrote in the 80s, Shaarei Talmud Torah got banned, even though he had nice haskomos including one from R Yaakov Kamenetzki. Later books of his are still found in rw yeshiva dorm rooms, and he has haskomos on those books as well. So it is possible to get past a ban, and influence the rw crowd. It's a matter of how important it is to you. The title of this post sounds like you were imitating the Chicxulub asteroid! Well, since the Litvisher Yeshiva world has the loudest voice, why not use Litvisher transliteration: "Aveis deRabbi Noson"
Jokes aside, Mazal Teiv on the accomplishment. 150k words is no joke. (2) I am no expert on what the most acceptable transliteration is in the scholarly world, but I would go with that. (3) Personally, I'd like to see Hebrew/Aramaic for ALL source-texts. This, in my opinion, would be appreciated by many of your readers (including any and all who study texts in their original form), and not be frowned upon by secular scholars. (4) Re:footnotes. I think that regardless of the layout considerations, footnotes could avoid the frustration and aggravation (especially in the frum community) that some of the difficulty choices you make could provoke. Say there are two sides to a particular issue, and brevity and/or clarity force you to take one. Having a footnote to acknowledge the other side and why you decided against it could go a long way towards defusing controversy or questions about your judgment/breath of knowledge on the topic, and assuaging the feelings of those who might disagree with your decision but nonetheless are impressed with your thought-process. 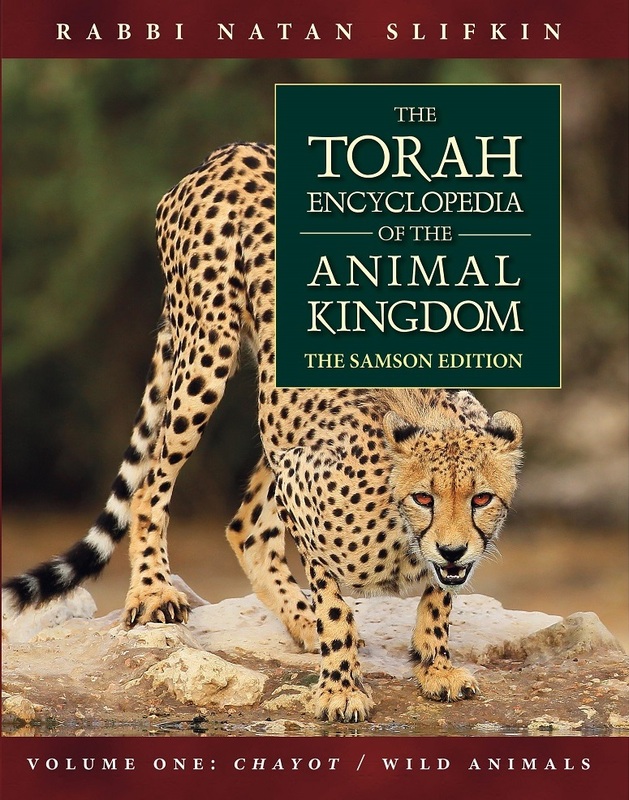 Although an encyclopedia article is by definition supposed to be the RESULT of intellectual debates rather than a back-and-forth discussion of such debates, for those in the Torah community who like reading your books (and others) which have discussions with the reasoning, and encyclopedia without the reasoning might seem dry and boring. On that topic, an animal which might properly be placed in either of two volumes may deserve an entry in the volume where the main article is NOT located, with a brief discussion of the sources of why it SHOULD be in that volume, followed by an explanation of why you followed sources to place it in the second volume. (Typographically, that entire mini-article might be in a smaller than usual font) Then, the second volume's article would also contain a (perhaps smaller font) reference to the discussion of why it is not listed in the first volume (eg See volume one, DOG, for a discussion of why this was not classified in that volume). Thus, controversies of this nature can be included in the work. You should publish two editions. One of them can have academic transliteration, can cite various academic sources and mention that chazal may have erred on science, and can have an author Natan Slifkin (M.A.). The other one should have Artscroll transliteration, avoid mentioning anything problematic, and can have an author Rabbi Nosson Fliskin. I think you should publish with a secular/non-Jewish press. You will find that the "frum" publishers edit with a VERY heavy hand and you will lose your "voice" - stylistically speaking it will end up sounding more like the editor than Rabbi Natan Slifkin. It's too late to have any significant readership if at all from the Chareidi population. Mazal Tov on completing this monumental work (is this also your theisis?). Regarding quoted text. As an english reader, reading an english book, I would hope that I could read and understand all the citations that are being made. I would suggest that anyone who wants to see the primary document should have enough infomration from the citation to view it in situ. Also if you are targetting younger readers, or a broad audience, citations quoted in the venacular make the text more accessable. I imagine that placing the hebrew/aramaic side by side with the english translation, although allowing the reader to immedieatly judge for themselves the veracity of your translations, would add significantly to the expense. Consider this; if you were quoting a French source, would you see a value in including the French original text? Regarding your citations (transliterations or english equivalents): Again, you are writing/publishing an English book. For this reason your underlying assumption should be that the most accessable citation will be to use the venacular. This will be particularly true of Secular and non-Jewish readers. Maybe the ebook could be offered in two versions, one for ArtScrollish and the other for normative Hebrew translations? I would suggest putting the Hebrew for ALL sources. If they take up too much room in the chapters, put them in the back and reference them. I HATE it when I read an English Torah book which quotes something and does not put the Hebrew. Sometimes the Hebrew is crucial to see if the translation and interpretation is pshat or not, etc. It also makes it much easier to quote the interesting sources in the right-leaning world. I vote for Shabbos, original Hebrew included with all translated source material, and Jeremiah (which will assuage the crowd who thinks that "Shabbos" is somehow un-Academic). Mazal tov! Looking forward to reading this. Include the Hebrew of all sources you quote, including from Chazal. Then you can write ויקרא in Hebrew and Leviticus in English. I think everyone who is more familiar with the Hebrew than the English terms also knows how to read Hebrew! I wonder if using modern Israeli style transliteration would keep the book more "under the radar" of those who might consider imposing a ban. They are really only interested in banning works that are targeted primarily to hareidim. If you are using Ashkenazis, you also need to write Vayikra rather than Leviticus. The publisher probably gets the final say on this anyway. That will shake them all about! Congratulations! I hope your book has much success. (ii) I believe the Ashkenazei transliteration used by ArtScroll and others is one of the subtle things that makes haredi Judaism seem more authentic to some, particularly ignorant ba'alai tshuva that do not know any better (I plead guilty on that score). I'm not saying that's why they do it, but I do think it has that effect, and I believe anybody that can do anything, however small, to counter that impression is doing the Jewish world a favor. "People on the right are more likely to be put off by Sephardic transliteration"
Such persons would most likely not be interested in your book anyway. "Should it include Hebrew text for the pesukim? (Probably, yes.)" " How about for the citations from the Gemara and Midrash? (Probably not.)" As long as there are English citations, I don't know what that would add. The work is an English-language sefer. I like having the sources in Hebrew, but I realize that this could make the book too long and expensive to produce. Another option is to only quote the Hebrew phrases when they are difficult to translate or ambiguous. I don't like it when authors translate ambiguous terms and then when you look up the source you see that their interpretation is not necessarily the best or only one. Sephardic transliteration makes it sound like a more serious work. However, using the English like "Leviticus" will sound strange to many of us. If you think your readers won't understand "Va-yikra" then put Leviticus is parenthesis, in the footnote, or include a glossary of these types of terms. Daniel Matt did this for his great English edition of the Zohar. Footnotes are better then endnotes unless they are really long or tangential. I suspect the Sefardi / Ashkenazi question is a question about Rabbi Slifkin's sense of self as well as about his target audience. Rather like Charedi arguments about their Torah protecting not being about literally Torah protecting. My advice (for what it's worth) - whatever comes naturally to you. As a non-right-wing-er, I really hope you put in the Gemara / Mishna citations. a) you did all the work. let others benefit. b) people will be able to follow your arguments and look up sources - you want to encourage people to get more involved, no? c) no-one will be put off. all will respect your scholarship. d) it's a serious work, not a dumbed down version. (i almost said 'an artscroll book'.) let it stand on it's merits. Thank you for the excerpts. I cannot wait to buy the full book! If you are counting "votes" here, I vote that you please include all quotes from Tanach/gemara (or other source you use) in its original native language. I like the ease a translation provides, but I like to see the original as well so i can compare your translation to my reading/translation of the source. Obviously this is just a personal perspective, but nevertheless. 1) I grew up pronouncing ivrit (sort of) and moved to a community where everyone pronounces Ashkenazi (a mixture of yehsivish and gallizianer). In my personal tefilloth and at home I use my best approximation to authentic Hebrew, which is 90% the same as what the Temanim do. I have zero problem whatsoever in understanding spoken Hebrew pronounced in an Ashkenazi way, but I must say that seeing it in writing still throws me off and, even when it's not impeding my comprehension per se. I find it hard to take seriously. I can't see "halachos" without thinking of breakfast cereal. My vote would definitely be for modern Ivrit transliteration (BBC Hebrew basically). I almost never use this in speech, but find it perfectly easy to follow in writing or orally. 2) Always use the original Hebre/Aramaic, for everything, for Gemara quotes it might be best to put them in a footnote, but they should always be there. On the other hand, I prefer references to be done with Arabic numerals than Hebrew letters. 3) Personally, I find it pretentious to use transliteration when there is an accepted English version. Do you say "Florence" or "Firenze", "Genova" or "Genoa"? The same should go for "Jerusalem"/"Yerushalayim", "Yaakov"/"Jacob". looking forward to read it in it's finished version. Ps for what it's worth I don't care about most issues (which are nevertheless important) but I can't stand Jewish authors quoting from "Exodus ", at the very least call it "NAMES", and Yaacov is not Jacob,personally a major put off for me.Names should not be translated, words yes but then correctly so. Bamidbor does not mean "numbers"
Rabbi Slifkin, I think you are missing the largest potential audience for your work, secular libraries and Christian readers who are interested in these matters. To peruse the bookstores near any seriously Christian population center is to encounter surprisingly large sections on Hebrew, Judaism and the bible. Virtually all seminaries, and bible studies departments will be interested in your book, budget allowing. I would definitely talk to someone in publishing marketing who undertands that market. You might discover that you can bridge the two markets without any compromise to your content. It should be "BIG Genesis" for "Genesis Rabba"
Go with whatever system your editor recommends. If you want your book to have the widest appeal, I'd recommend keeping "Jeremiah" and "Job" as they appear in English. I would not alter the book in the hopes of appealing to a chareidi audience. Someone else commented about being able to overcome a ban - that may be true in some circumstances but not yours IMHO for two reasons. (1) You fought the ban instead of being mevatel daas to the "gedolim." While this has earned you admiration from many, it's not going to be overlooked in the chareidi world. (2) Your continued critique of the chareidi lifestyle. While many appreciate both of these, including myself, it's not going to make your book a welcome addition to the charedi bookshelf. I would use Sephardic transliteration. In terms of style, I would aim for pleasing centrist Zionist Orthodox audience and the academic biblical scholars. I think that means giving the Talmud/Mishna text with translation, but keeping your source references in their common English equivalents like Job and Leviticus. For what it's worth, I reread most of your leopard sample chapter yesterday and thought the decisions you made for that chapter were just fine. I don't see a need to change. As for all these comments about academia, I don't think you are writing this encyclopedia to earn the respect of a couple dozen professors. And only the most snobbish professors, in any event, would ignore a work because of dissatisfaction with transliteration! Use Sephardi or use Ashkenazi, but please, please, please do not use the incongruous Artscroll combination of Ashkenazi consonants and Sephardi vowels!